One of the reasons it’s hard to post before Christmas in this category, is that usually my little personal craft factory (my two hands) is buzzing away making Christmas gifts for people. Including those who read this blog, and I don’t want to let any cats out of any bags. This particular piece was a Christmas gift for my husband. The pattern came from my lovely friend Arlene, who had bought it to make for her fiancee and was lovely enough to share with me. If you don’t pattern share with your friends – you should! Though there are many free patterns available online, the ones at stores like Michaels are still very expensive, and it’s no different from loaning out a great book you’ve already read. 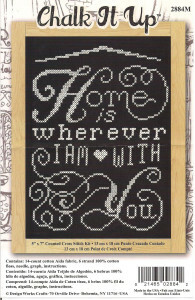 Something to note about this pattern; it says it is 5 x 7, and as I’ve found with other patterns made to fit standard sized frames, it doesn’t quite. I bought a frame with a lovely double mat, had to rip out the bottom mat, and it was still too large for the frame. This happens because with pictures we expect to lose a bit of the edge to the frame holding it in place; the opening is usually a quarter inch smaller, or so, than the size designation, because you need that lip to secure it. Unfortunately, with needlework, that looks a little funny. I’ll often buy a frame a size up and add a blackwork border (or just leave “white space”) because I’m so distracted by losing the edge of the needlework. This time it worked okay to have a bit of overlap, but it still bothers me. At any rate, as soon as I saw this pattern, I knew it wasn’t going to be white on black for me. I’d recently picked up a package of variegated/ombre embroidery floss at the dollar store. 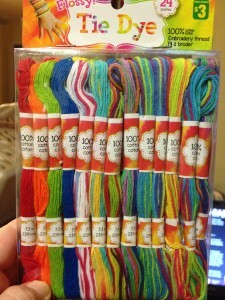 (I can’t get enough of dollar store craft aisles. Seriously, it’s where half my scrapbooking material comes from nowadays). I had bought this for another project (covering earbud cording so the little black cat can’t nom them as easily, post on that to come!) but there was plenty in the package to do both projects and then some. 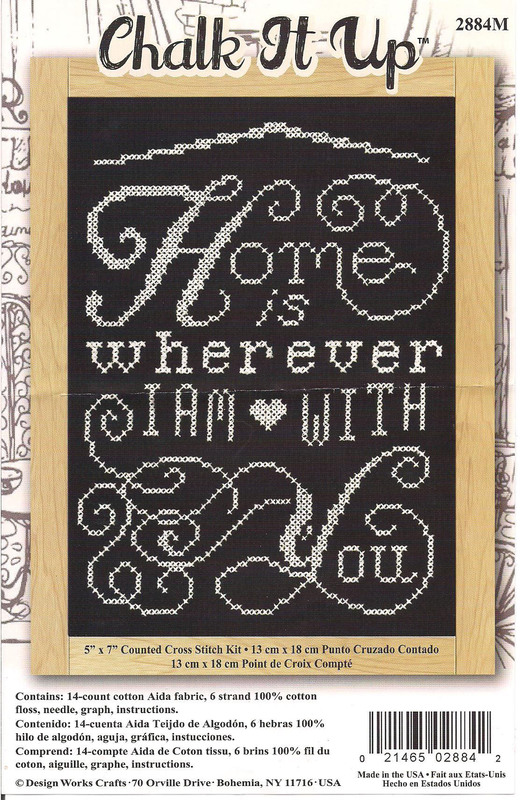 If you’ve never cross-stitched with variegated thread before, you should know that it’s a little different from “normal” cross stitching. You need to make each cross individually, rather than doing the bottom stitch across an entire row and then moving back along it with top stitches. This is so you can capture the colour changes properly, and not have wildly different colours atop one another. For a big project with heavy rows, this might be daunting, but it’s something I’ve been wanting to try for a while, and the lettering and scrollwork here seemed to lend itself naturally to the technique. The finished project is bright and colourful. And also slightly crooked in it’s frame. I didn’t notice that til now. Hm. Well, nobody’s perfect. Looking back, I likely would have chosen a slightly more muted colourway for the floss, but the bright and cheerful colours spoke to me when I was rummaging through the package. I used the solid blue and the red as accents because the piece seemed to need some “grounding” as I worked along. Colours that were a bit more somber in nature did the trick nicely. I also noticed after I was done that the “roof” portion, done according to pattern, seemed crooked to me. (It was). I hate that. Symmetry for the win! I began to pick out stitches, planning to repeat the left side in reverse on the right side only to discover that the dark floss had discoloured the bright white aida cloth already. So much for that; I put the stitches back in. But if it bothers you too and you do a pattern like this, pay attention the first time through so you can adjust it yourself! 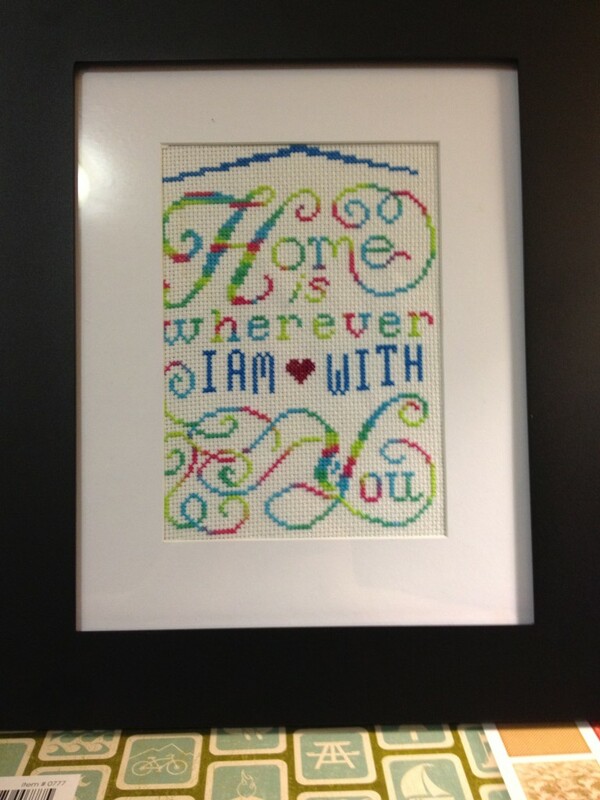 This was a super quick project – a couple of evenings staying up later than my husband and I was done! It was ready to go under the tree long before we had the tree up. I llove it. Neat idea with the colors. It actually turned out much brighter than I thought it would! Variegated floss in the skein can be deceptive! I may re-frame this into something that fits it better down the line, though. I think it needs a bigger, cleaner frame to balance the bright colours. Maybe all in white.